This LO is of my Niece Gwyneth – the photo was taken a long time ago – she is turning 8 this week. The Everyday Enchantment SAB papers are lovely and the matching brads and ribbons finish off a LO perfectly. I have inked/sponged around the edges of all the paper pieces and doodled a little too. This LO is bright and summery. I got the general idea from a magazine cutting from a friend. All the elements are sponged with black ink and some doodling around the edges has been added. The patterned paper comes from a Designer Series Paper Stack and Big Top Birthday. 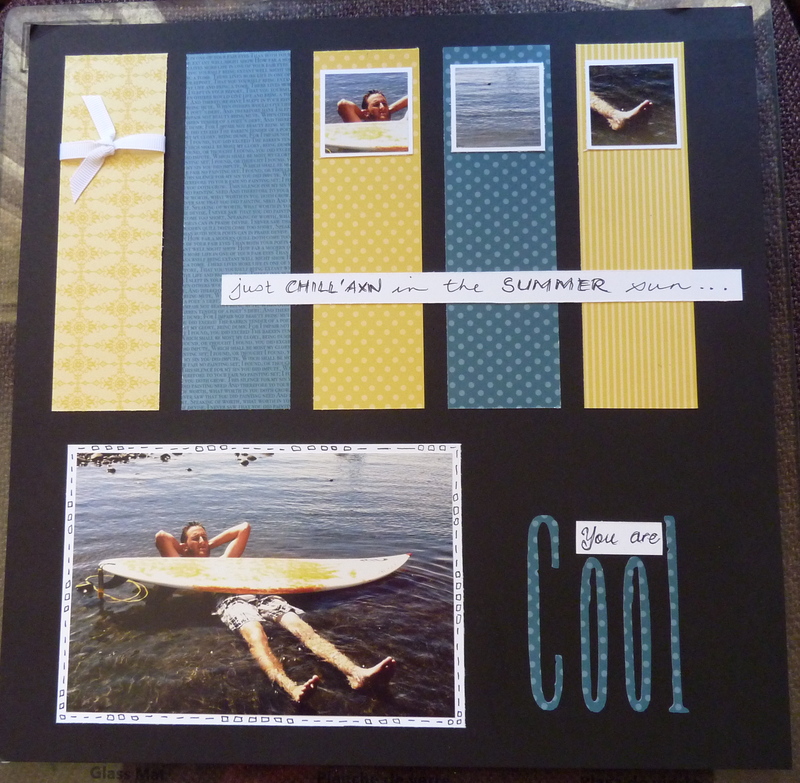 I stamped with Sunny Fun on the patterned paper and individually cut each one to create the mixed color columns of jandals. 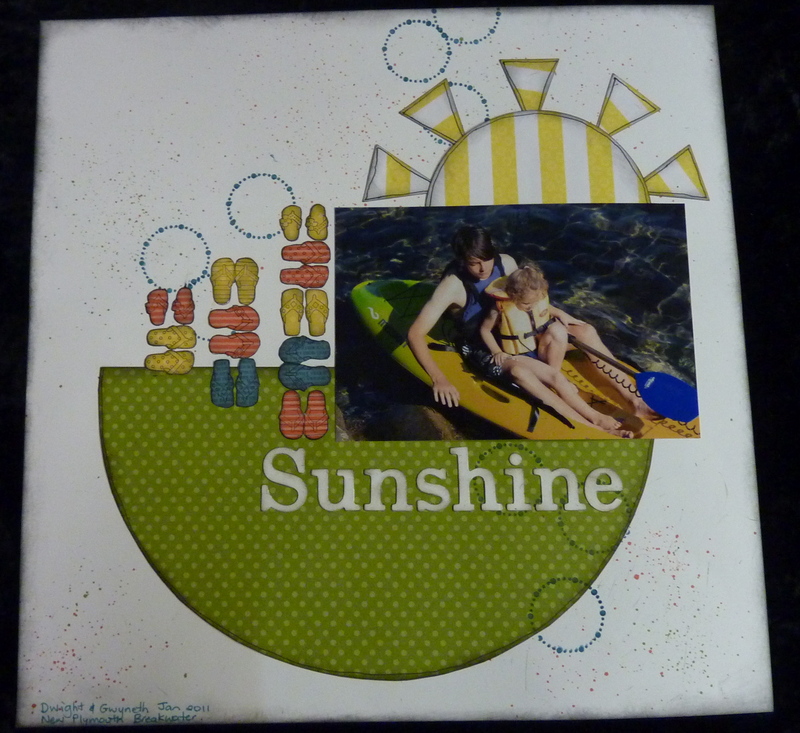 I added some spritzing, Circle Circus stamps and the Petite Pennant Punch sunshine rays. I really like the finished page. Dwight and Gwyneth at the Breakwater. This LO is from a Page Map – I find PMs are a good place to start if you need inspiration. 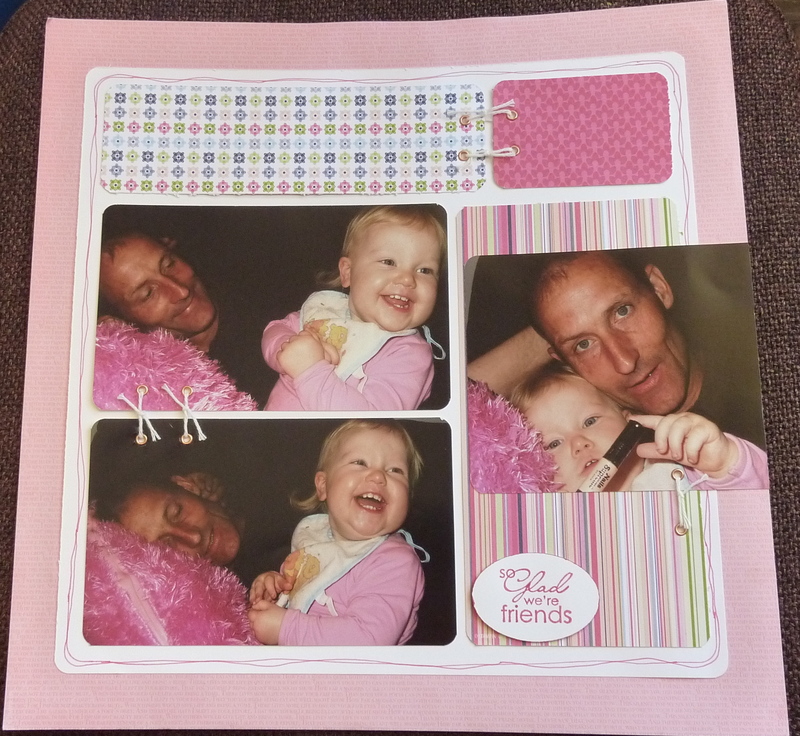 These are old photos of Mike and our niece Felicity, she says that Mike is her “best friend”. Bakers twine is one of my new favorite things to use, on this LO I threaded it through some eyelets. Cheerful Treat DSP has great colors that work perfectly for a pink page. This LO is quite different from what a usually do. My inspiration came from a magazine cutting. I had two prints of the one picture so I punched out some pieces to make three small pics. I did some doodling, added some strips of paper, ribbon and some titles. The Patterns Designer Series Paper Stacks are so fun to use, I love the coordinating colors and patterns.